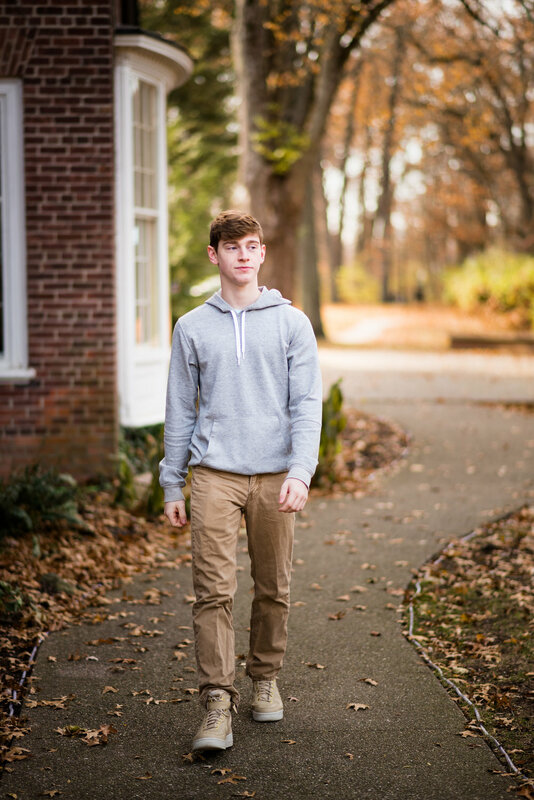 Reid is a senior at Bedford High School in Temperance, MI. He will be graduating this spring and entering a new stage of life. Reid was laid back, and happy to go with the flow. I had to embarrass him a few times, in front of his mom, to make him smile, but he was naturally great in front of the camera. His style was trendy but low-key. Reid was great at faking comfort despite the chilly temperatures. Working with young men, seems to be a niche that many senior photographers do not dig into. There is a thriving market for photographers to be a brand who offer female seniors, hair, makeup and more of a modeling experience (also a lot of photoshop). I really do admire these senior photographers’ work. For my own brand though, I have decided to strive for a natural look that accurately represents each teen’s personality. Any young man is welcome: sports player, musician, artist, gamer, hunter, cook, actor, tekkie, gear head, skater… whatever they might be into. I want to incorporate that into their session and highlight who they are. REBECCA TRUMBULL IS A SENIOR PHOTOGRAPHER LOCATED IN TOLEDO, OHIO. SHE HAPPILY SERVES TOLEDO AND ALL OF NORTHWEST OHIO WITH HER PORTRAIT PHOTOGRAPHY AND WEDDING PHOTOGRAPHY WORK.